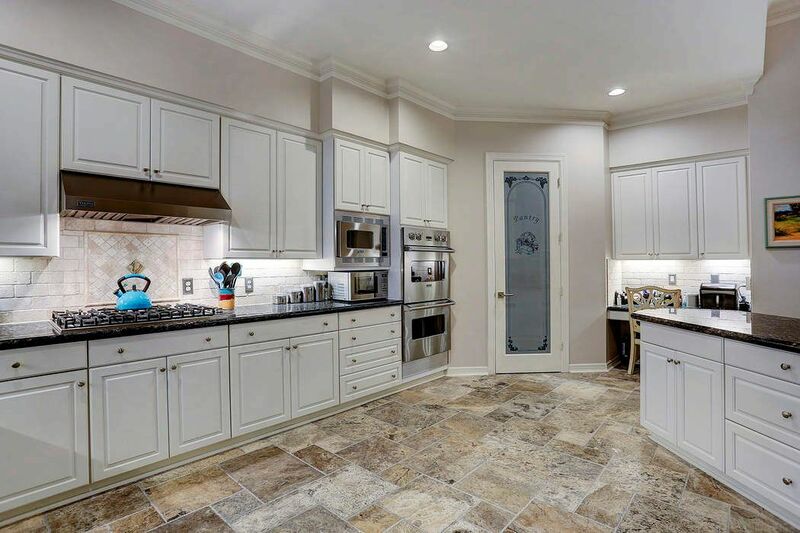 203 Heritage Oaks Lane, Houston, TX 77024 | Martha Turner Sotheby's International Realty, Inc. Welcome to 203 Heritage Oaks Lane located in the heart of Piney Point. This custom home features 4 BRs, 5.5+ baths & separate guest suite w/full bath not included in the SF of the home. Numerous updates make this home ideal for immediate occupancy. 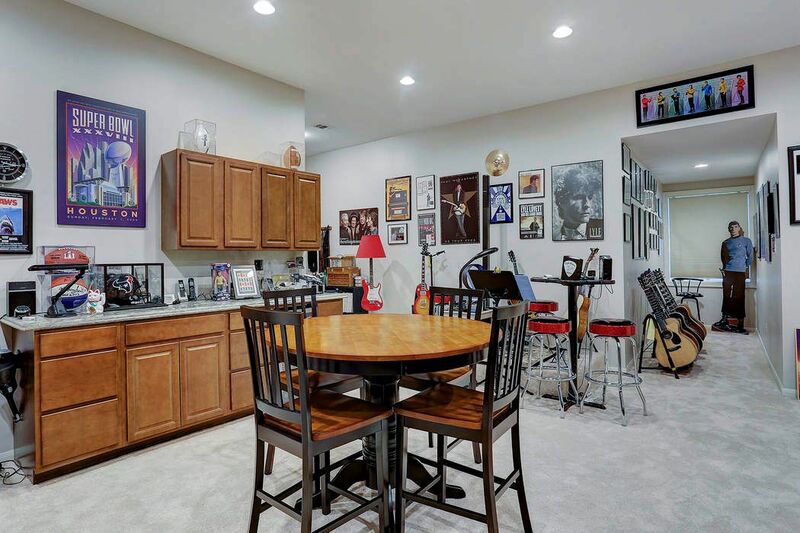 Located at the top of the stairs is the recreation room set up as a “man cave”. 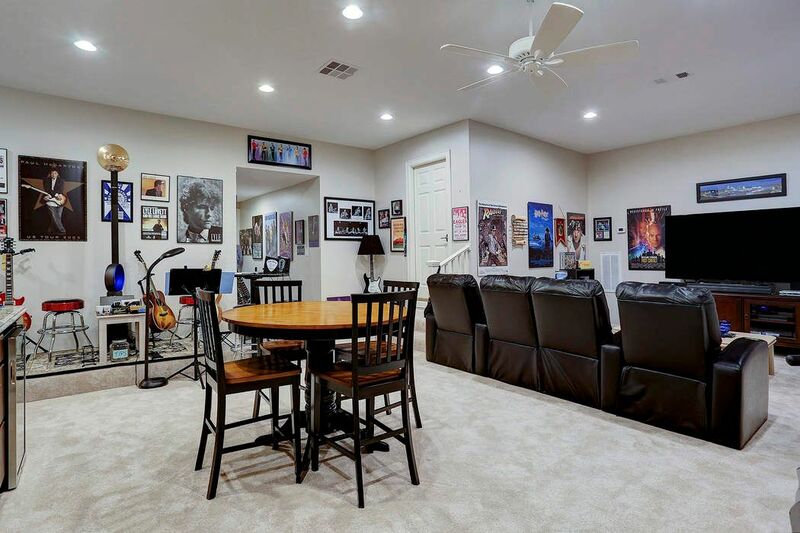 Ideal as a media room, game room or craft room, this space was completed in 2013. The door accesses attic space and the guest quarters over the garage. The media room located on the 2nd floor with 10’ ceiling includes living area, dining area, powder bath and game area. A collector’s dream space for displaying and enjoying one’s collections. Ideal for quiet meditation too. 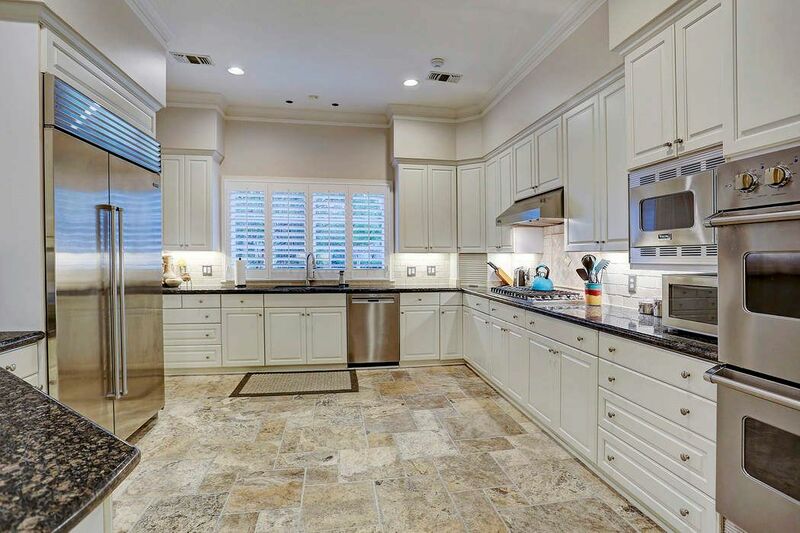 Open kitchen (21 x 14) includes recent stone floor, stainless steel appliances (double ovens, microwave, dishwasher, refrigerator/freezer), granite counters and walk-in pantry. Out of view is the desk area and breakfast room. A view of the kitchen (21 x 14) from the breakfast room over the serving bar. The planning desk area and pantry are to the right of the image out of view. Lots of windows provide natural light. 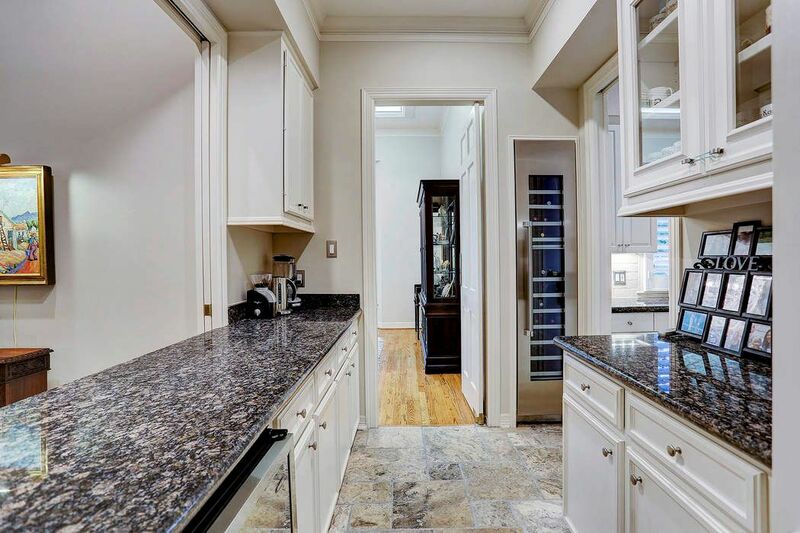 The open kitchen (21 x 14) with recent stone floors and granite counters includes a large walk in pantry with decorative etched door and well-lit planning desk. The granite counter to the right of the image opens to the breakfast room. 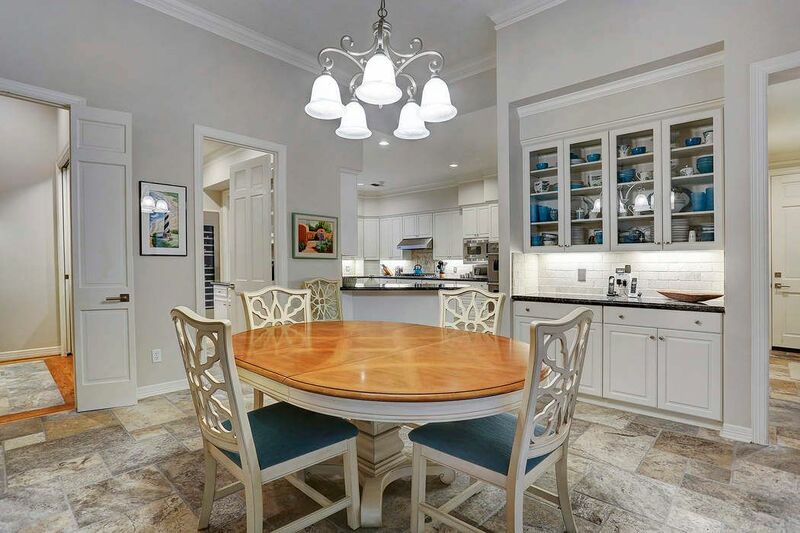 The Butler’s Pantry is strategically located between the kitchen, dining room and breakfast room and opens to the gallery to the great room servicing all entertaining areas of the home. Fabulous storage for wine, china and barware. 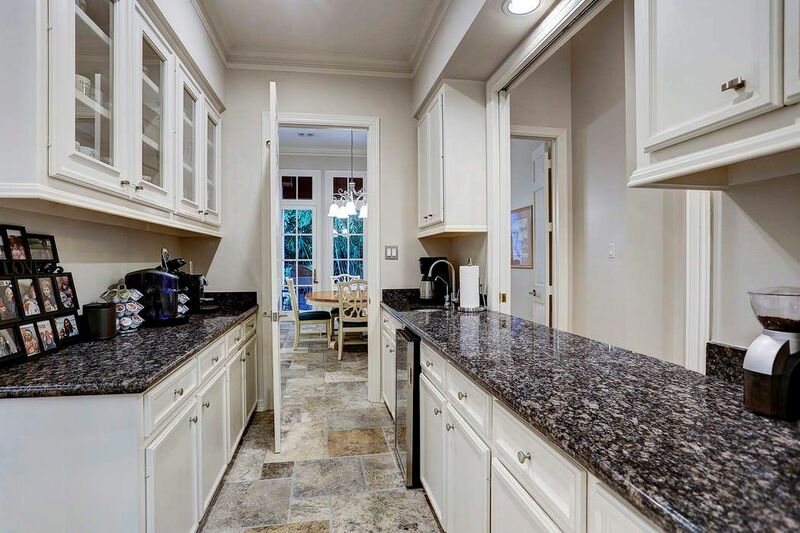 A view of the Butler’s Pantry from the dining room toward the breakfast room noting the recent granite counters, ample cabinets-uppers with glass fronts and recent stone flooring. Clean lines with neutral décor. The great room is divided into formal and informal conversation areas with the formal area focused on the fireplace and wall of built in cabinets. Note the size can accommodate a baby grand piano with views of the Zen garden. 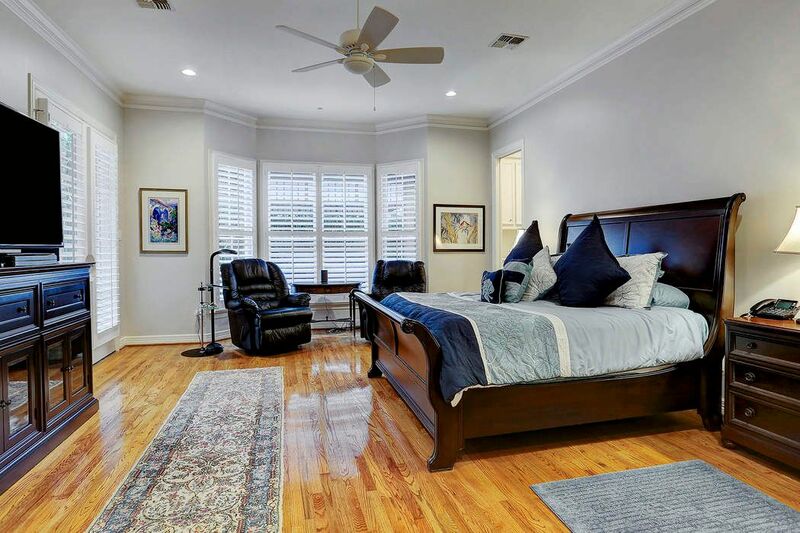 The first master suite (21 x 17) features oak hardwood floors, DUAL MASTER BATHS, crown molding and access to the backyard through double French doors. One of the master baths has TWO walk in closets. Plantation shutters too! 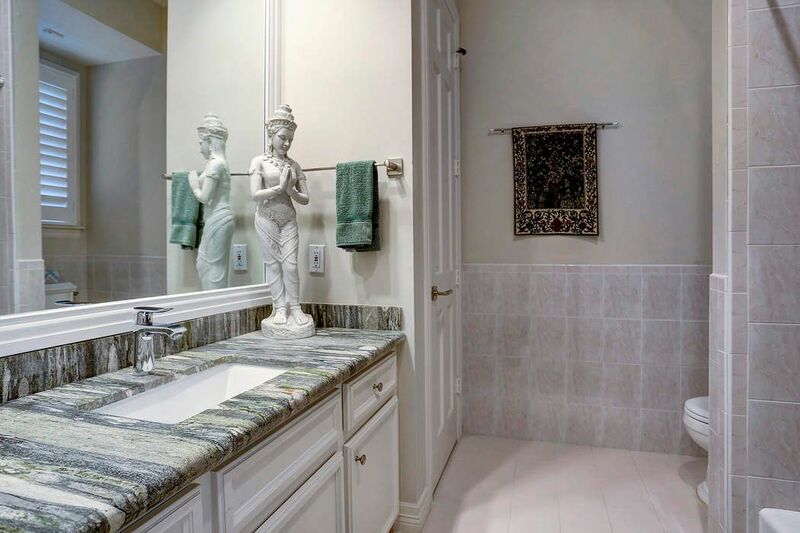 One of the master baths includes a large granite vanity with over mount lavatory and make up knee space. 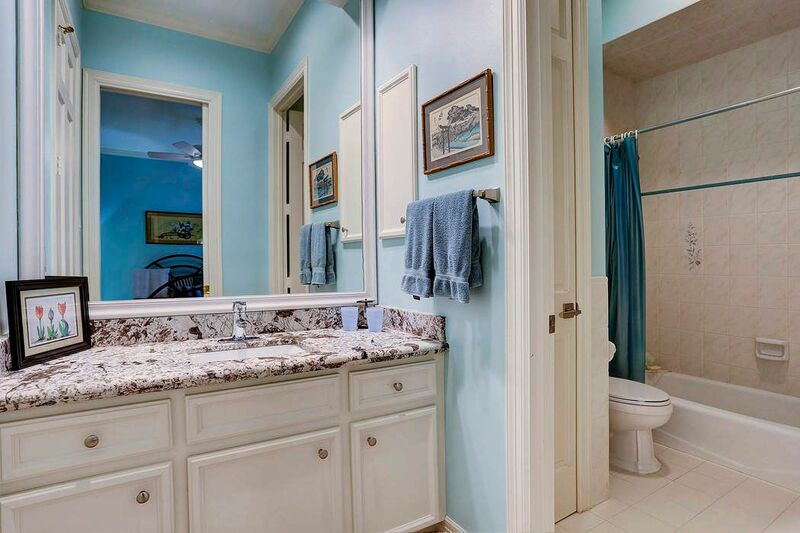 There is a private water closet and separate tub. One of the master baths focusing on the separate tub in marble decking. The private water closet is out of view to the left of the image. There is a large vanity with lavatory & make up knee space. There are two large walk in closets too. 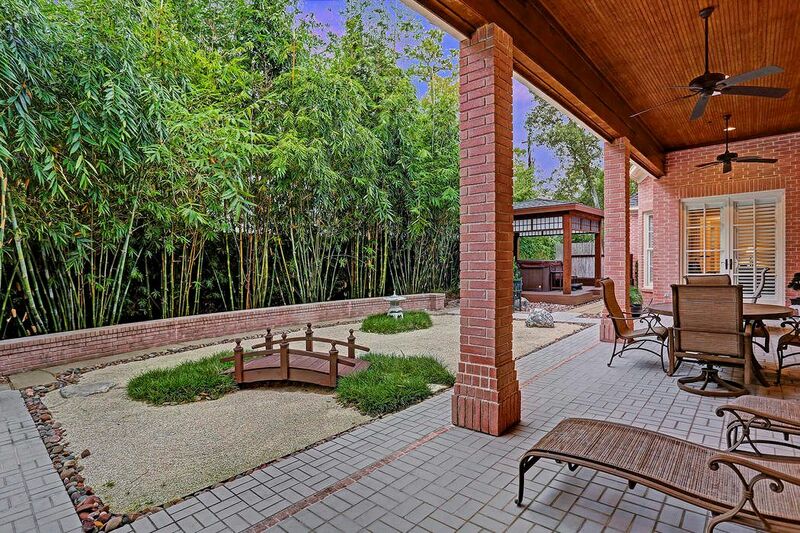 The ZEN GARDEN in the 30,388 SF LOT/HCAD is accessible from the master, the great room and the breakfast room. The large back yard wraps around on the north, west and south sides of the property. The hot tub is just outside the master. 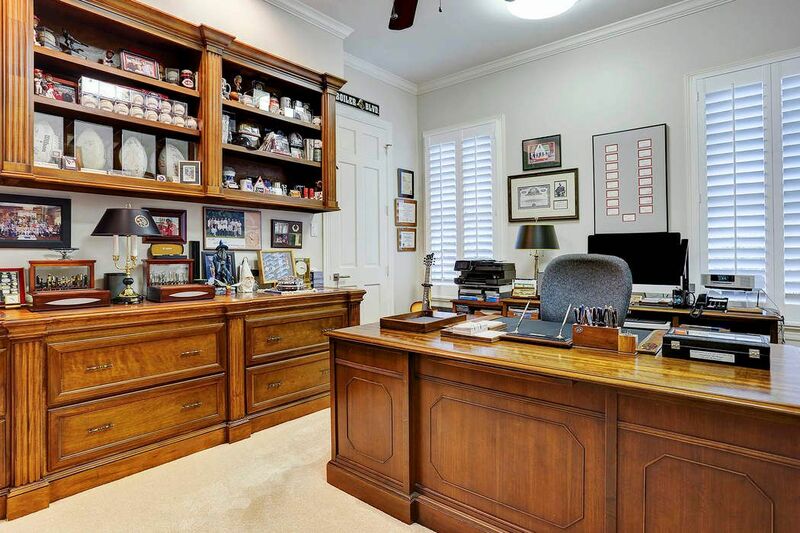 The study is located off the entry across from the dining room & is accessible to the bedrooms. 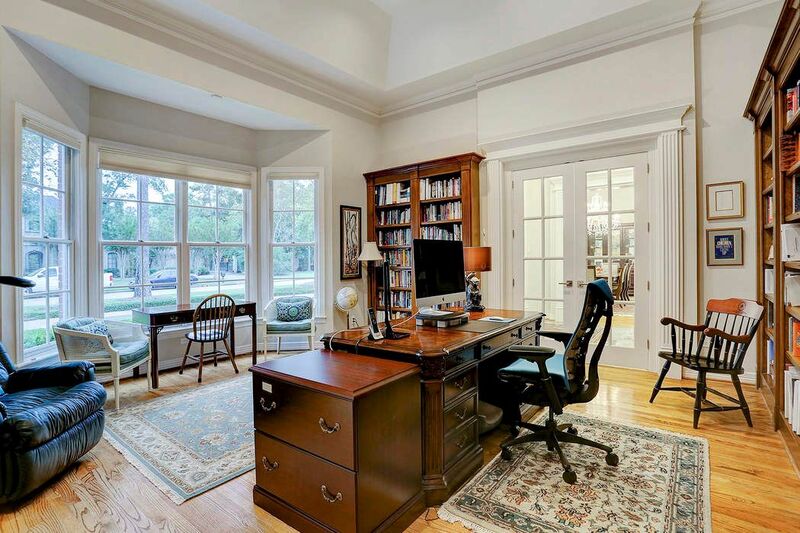 Hardwood floor, high ceilings, crown moldings, Bay window & walls of built in stained bookcases complete this space. Ideal for working from home. The study as viewed toward the fireplace and door to the bedrooms. High ceiling, bay window (out of view) and walls of stained built in bookcases plus double divided light French doors to the entry complete this space. One of the four secondary bedrooms is set up as a home office. 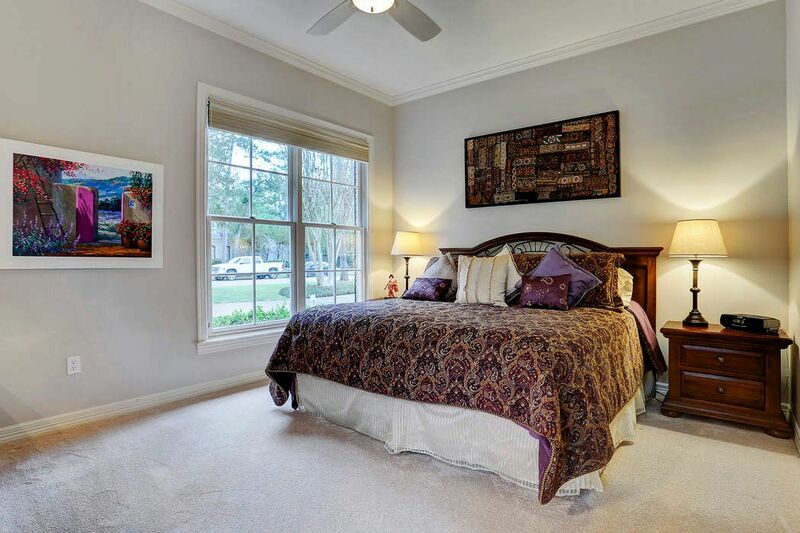 There is a large walk in closet and access to a full bath making this room ideal as a guest bedroom or family member’s bedroom. Note the built in dressers with upper bookcases. 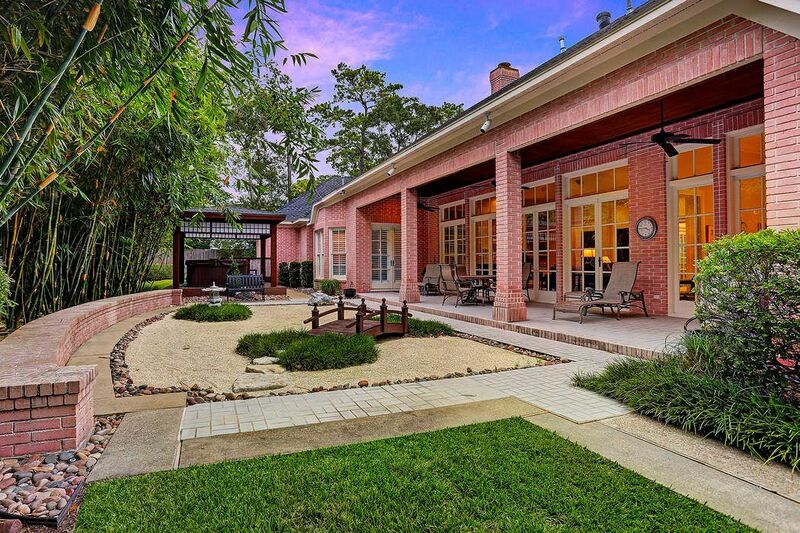 Exceptional yard space in this over 30,000 SF LOT in Piney Point Village. The yard as viewed from the driveway/hardscape toward the Zen garden and hot tub area. Something for everyone. Bamboo for privacy. The rear elevation includes a lovely covered patio complete with ceiling fans and French doors to the master, the great room and the breakfast room. Grassy area for children and pets alike, Zen garden, hot tub area and large grassy north yard. 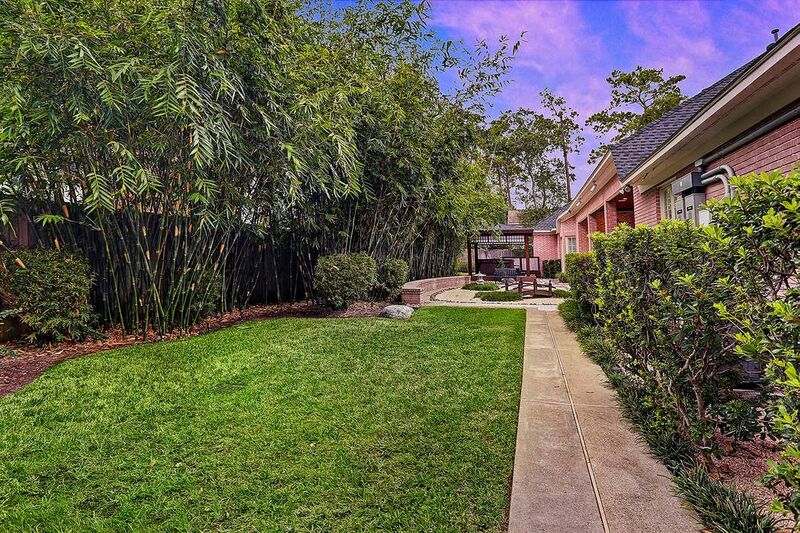 Fabulous north yard in this 30,388 SF LOT/HCAD with large drains. Plenty of room for children and the young at heart to play or for pets to be separated from guests. Beautiful yard. A view of the north yard as viewed from the front of the property (east). 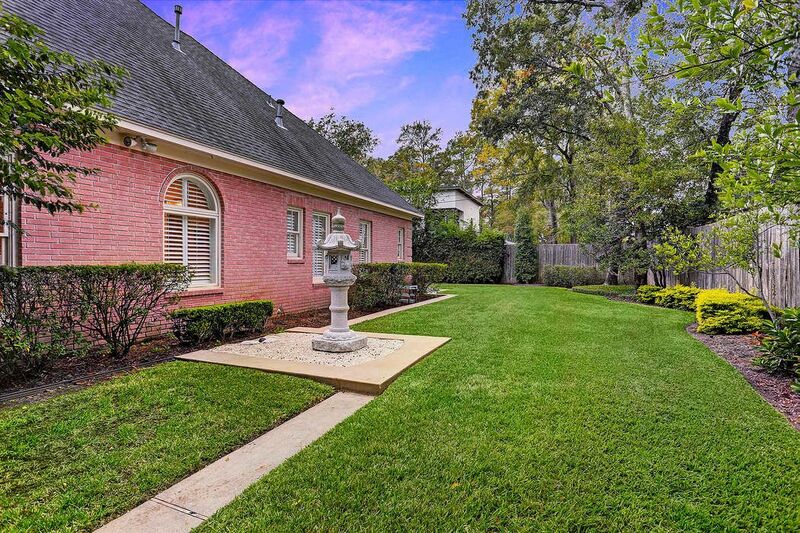 This property is well manicured and maintained inside and out! 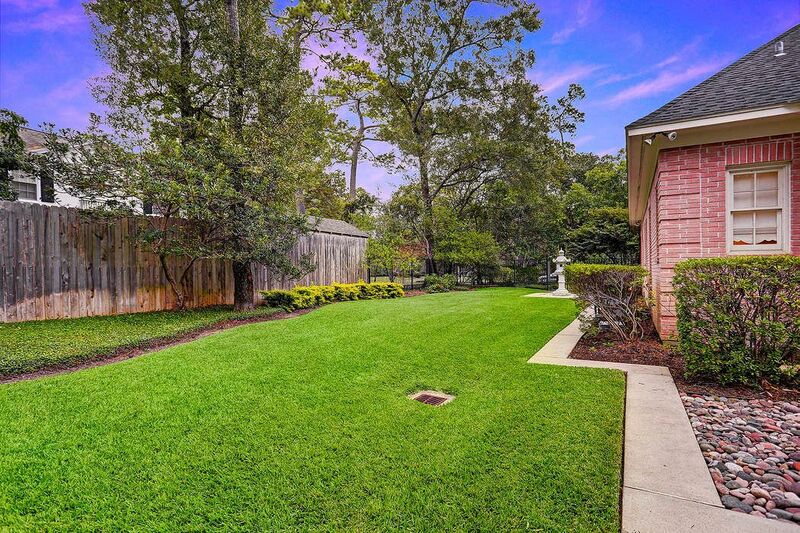 Fabulous cul de sac location in the heart of Piney Point Village. 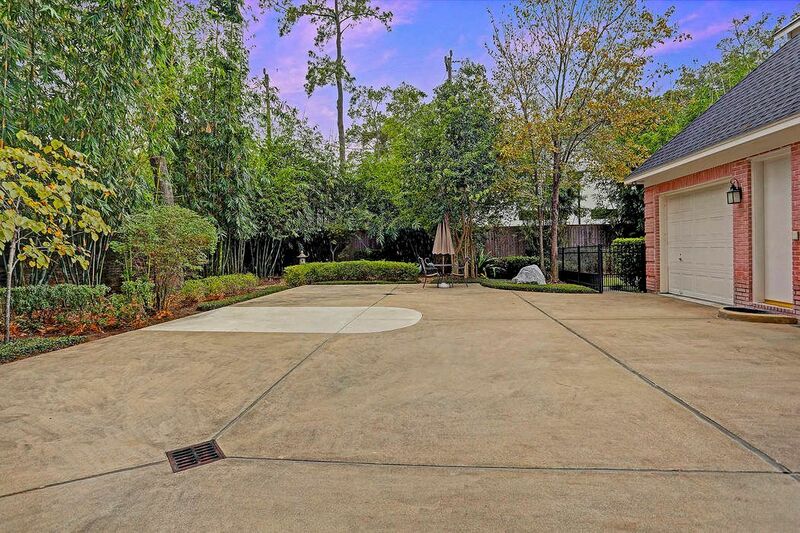 Wonderful backyard with a grassy area gated separately from the driveway/hardscape/basketball area ideal for a swing set or fort for young children. So many options in this incredible backyard. One of the secondary bedrooms set up as a guest room. Note the size of the room as this is a KING SIZE BED. There are (3) secondary bedrooms or a total of (4) bedrooms plus the GUEST QUARTERS WITH FULL BATH. The bright and cheery breakfast room (16 x 13) opens to kitchen, the Butler’s pantry, the gallery and the back hall to the laundry room, informal powder bath and 3-car garage. There is a built in buffet with upper glass front cabinets. The breakfast room (16 x 13) as viewed from the Butler’s pantry toward the French door to the covered patio. Note the planning desk in the kitchen area, the built in buffet and door to the service area of the home. This full bath with tub/shower services the secondary bedrooms. Note the privacy wall for the toilet and the large linen closet. Beautiful recent stone vanity with under mount lavatory. Plantation shutters too! This private en suite bath attaches to one of the secondary bedrooms. Recent granite vanity with under mount lavatory and separate “wet” area with toilet and tub/shower. Ideal for a family member or a guest with private bath. 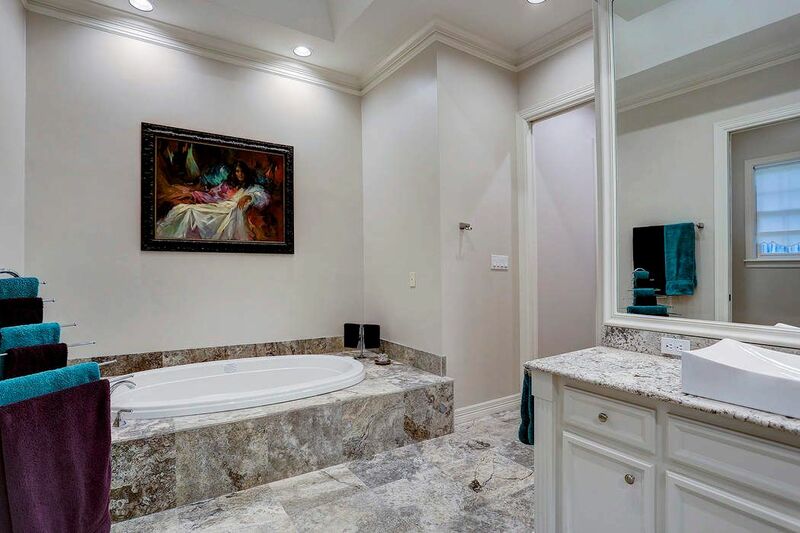 There are dual master baths-this full bath with large recent granite vanity and large shower with frameless glass enclosure. There is a large walk in closet too. 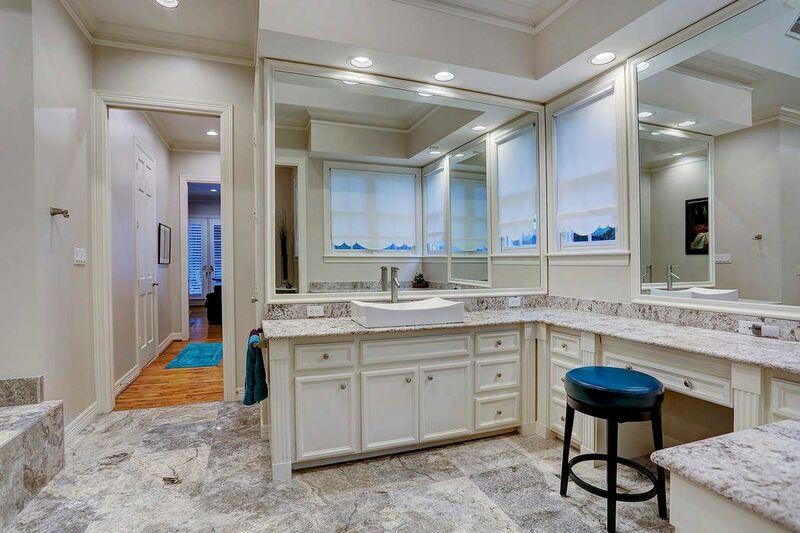 The formal Powder Bath is located adjacent to the great room giving guests privacy. 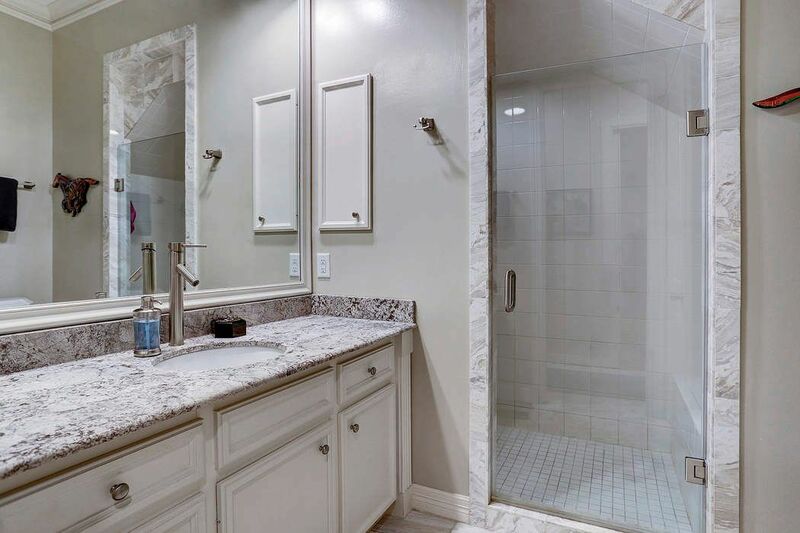 The recent granite vanity is graced with a vanity mount lavatory and chrome faucet. Bright and shiny. The dining room (19 x 14) with 13+’ double coffered ceiling and divided light bay window is overlooking the circular drive and front yard. Large cased opening to the graceful entry and gleaming hardwood floor complete this space. 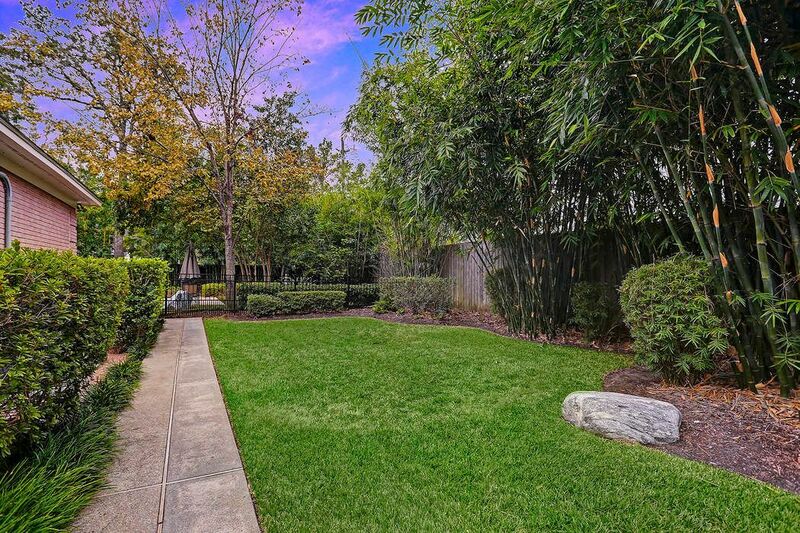 The GATED driveway to the 3-car attached garage & separate entrance to the GUEST SUITE w/FULL BATH is a great hardscaped area to play basketball or make sidewalk art with chalk. Great place to park additional cars if the circular drive is full. 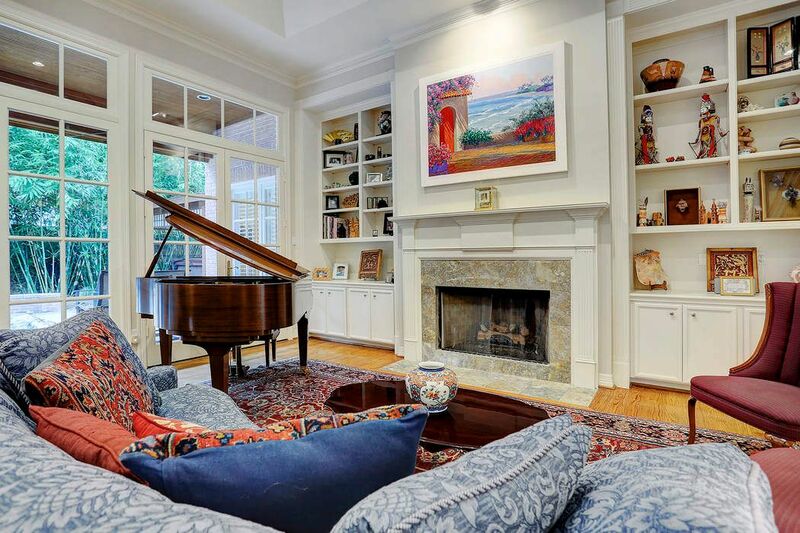 The informal seating area of the great room (30 x 18) with 14’ ceiling boasts oak hardwood floor with a natural stain, opens to the more formal seating area with baby grand piano and fireplace, and has a French door to the covered patio. The Great Room from the informal seating area through to the formal seating area with baby grand piano and fireplace. Note the large cased opening to the gallery and the gracious entry. The back wall provides fixed and operable French doors. 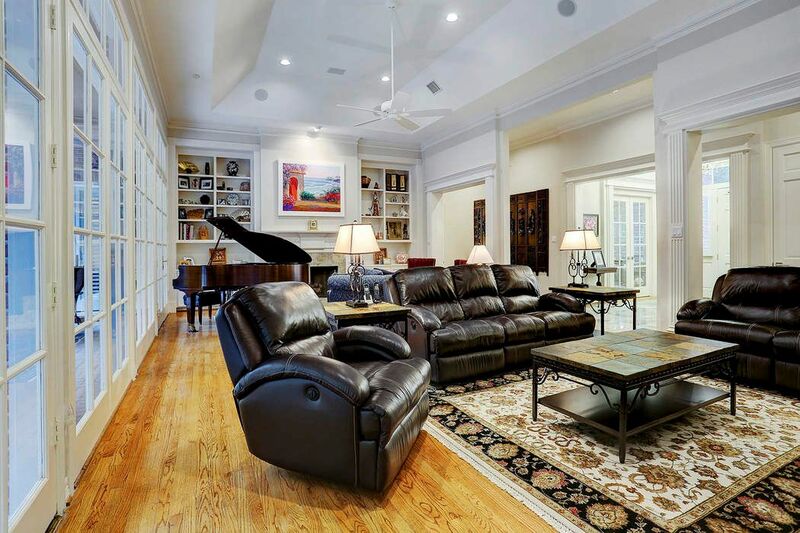 $1,800,000 4 Bedrooms5 Full / 3 Partial Baths5,912 sq. 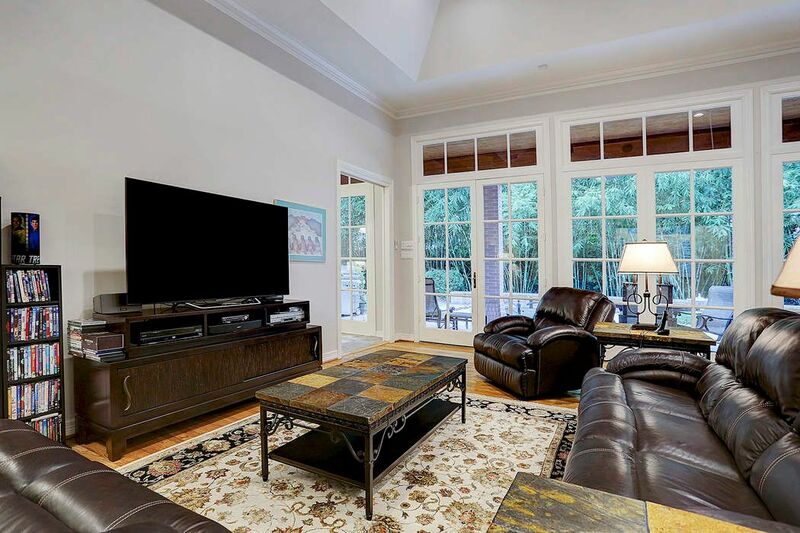 ft.
Picture perfect traditional home located in the heart of prestigious Piney Point Village. There is a guest suite/quarters with full bath located over the three car garage with a study and its own private entrance. Generator installed. 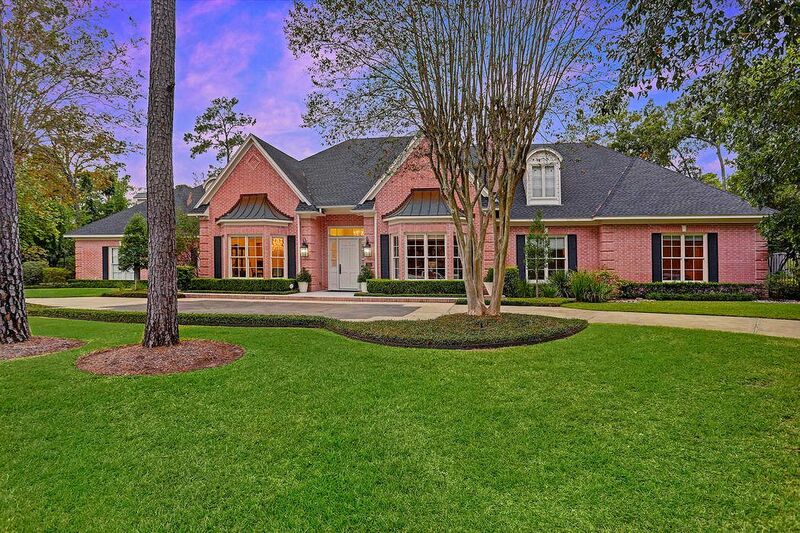 Sweeping lawn and lushly manicured grounds introduce this custom jewel. Stately details such as wood floors and fashionable crown molding are indicative of the quality used throughout. The stunning foyer anchored by granite flooring, beautifully unites the dining room, living room and great room which embrace a seamlessly transitional floor plan. 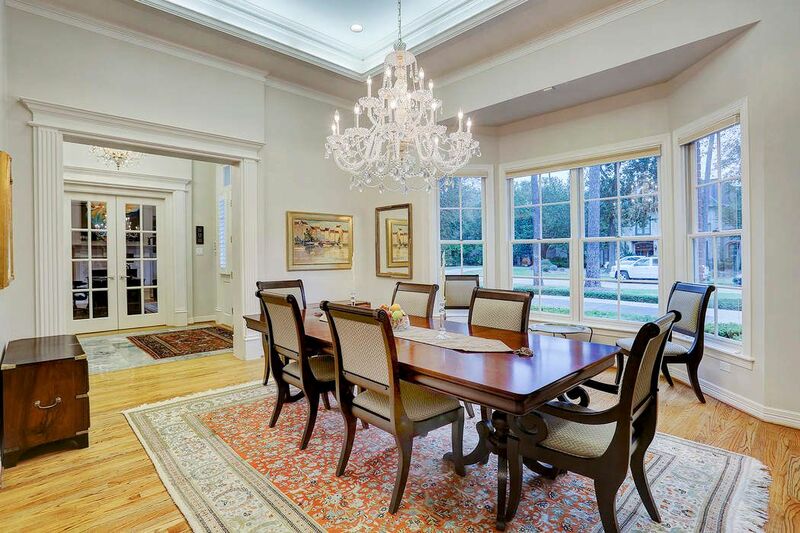 Outstanding millwork abounds in the dining room that features a coffered ceiling, exquisite chandelier, convenient built-in buffet and grand view of the front lawn afforded by the charming bay window. 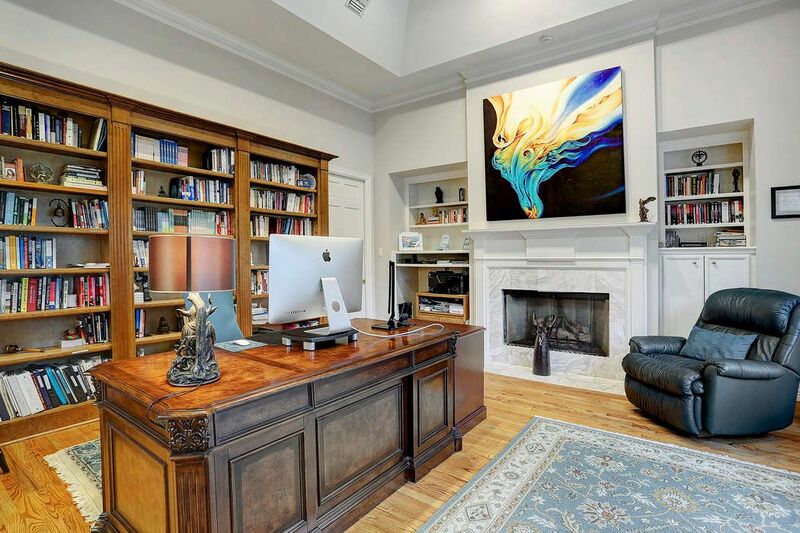 Behind double French doors, the handsome study has a wood burning fireplace and walls of built-in bookcases with the bay window providing serene vistas of the front lawn. Expert craftsmanship and refinement are evident in the light-filled great room where banks of windows afford compelling views of the covered patio and Zen garden. 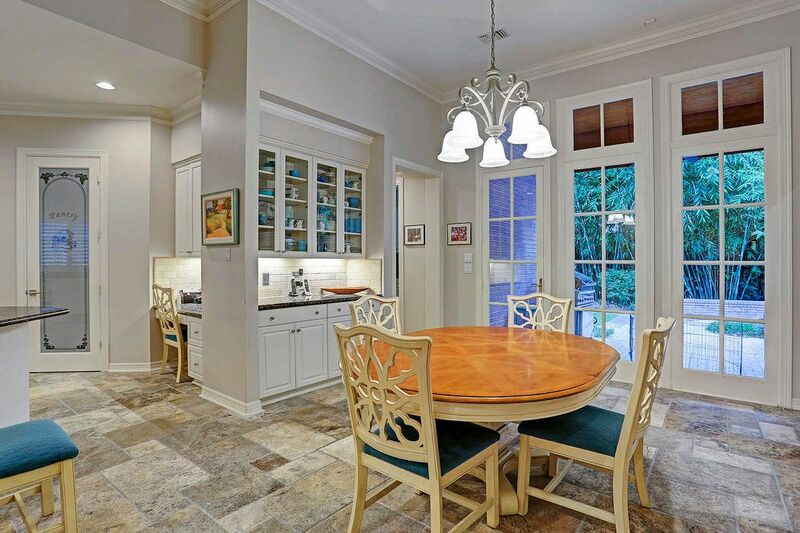 The invitingly casual breakfast room employs a stone floor in Versailles pattern and is masterfully positioned to unite with the kitchen, butler’s pantry, gallery back patio and service area. 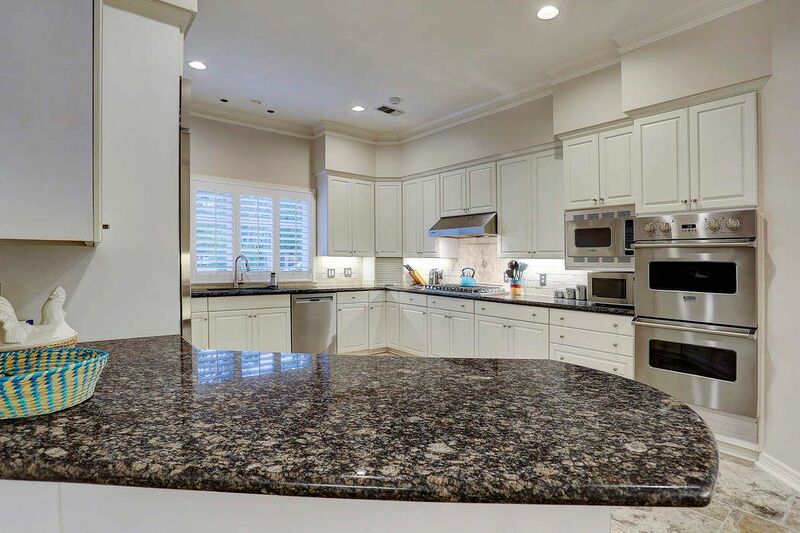 The kitchen has a marvelously clean design and features granite counters with subway-style tumbled marble back splash, Sub-Zero stainless steel refrigerator/freezer, Viking six-burner gas cooktop, double ovens, microwave, Bosch dishwasher and appliance garage. 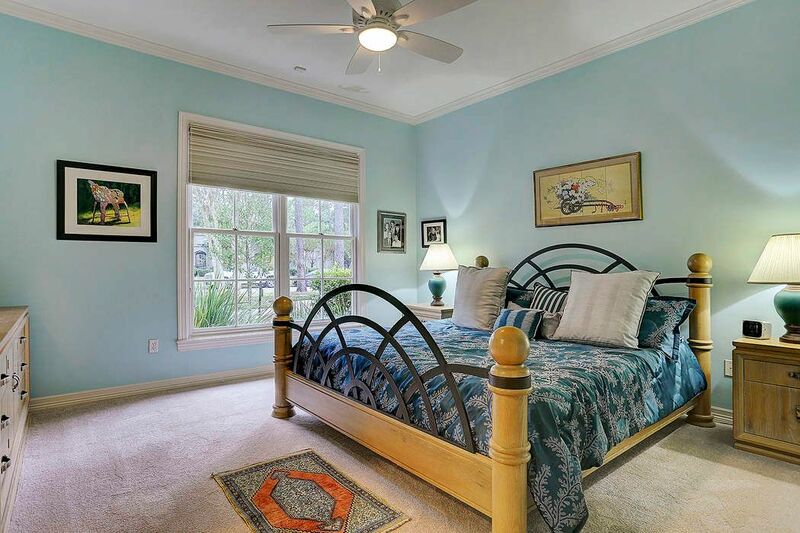 Double French doors give master suite access to the backyard and hot tub. 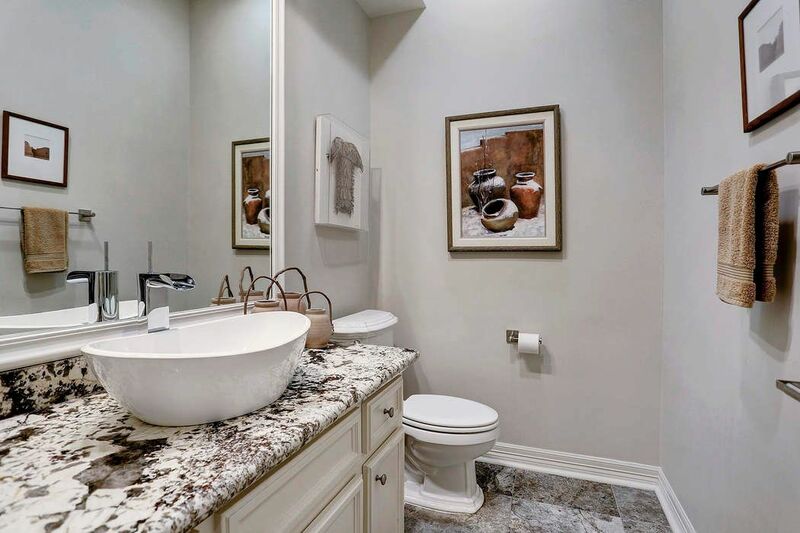 Dual baths in the suite, boasting marble floors, granite vanities, private water closets, walk-in shower, and walk-in closet with a cedar closet that features custom touches for organization and storage. There are three additional bedrooms and two bathrooms. A media room which includes a living, dining, game area and half bath is located upstairs.